Los Angeles Air Force Base is located just south of Los Angeles International Airport and less than a mile west of the San Diego Freeway (I-405) in the city of El Segundo, a part of Los Angeles County. Beach, mountain, and desert recreation opportunities are just a short drive away. World renowned theme parks and the glamour of Hollywood are right here as well. 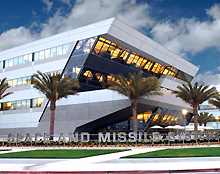 Los Angeles AFB is headquarters to the Space and Missile Systems Center, part of Air Force Space Command. It's the only active duty installation in Los Angeles County.